This week's Sunday Night Suds looks at Bazelet Brewery's Wheat and Ale. Towards the end of our week+ in Israel, we took a trip up north which included a day trip to the Gamla Natural Preserve and a tour of the Golan Heights Winery. After we finished the winery tour, I was perusing the shop and came across four beers made by the local Bazelet Brewery. Although I came to the winery with the intention of buying wine (which we did in fact buy), I could not pass up the opportunity to purchase singles of the four Bazelet products, including the two reviewed tonight - Bazelet Wheat and Bazelet Ale. The Bazelet Wheat was interesting take on a wheat beer as it had some of the flavor profile, but almost none of the looks. Unlike a traditional wheat beer, the Bazelet wheat was not unfiltered and there was no cloudiness or "floaters" in this light brown brew. There was decent carbonation and some phenols, but the banana like flavor was mild. According to their website, the Bazelet Wheat has a 5.1% abv, but there was not a significant alcohol taste. If I had the option, I might have bought more of this brew as Mrs KB found it quite tasty. However, the beer itself was not true to the style and is not for those looking for a Hefeweizen or even an American Wheat Beer. Unlike the Bazelet Wheat, the Bazelet Ale is much heavier beer, both in terms of flavor profile and alcohol content. This beer has a 6.4% abv and is reminiscent of a barley wine, both in terms of the warmth of brew, the richness of the hops and the alcohol backbone. I very much enjoyed this beer and would recommend it to those looking for a barleywine without the 10% abv. The good folks at BA have not reviewed the Bazelet Wheat, but there is a review of Bazelet Ale which can be found here http://www.beeradvocate.com/beer/profile/18537/66566. Both Bazelet beers are certified kosher by the Rabbanut of Katzrin and there are certification marks on the back of each label. 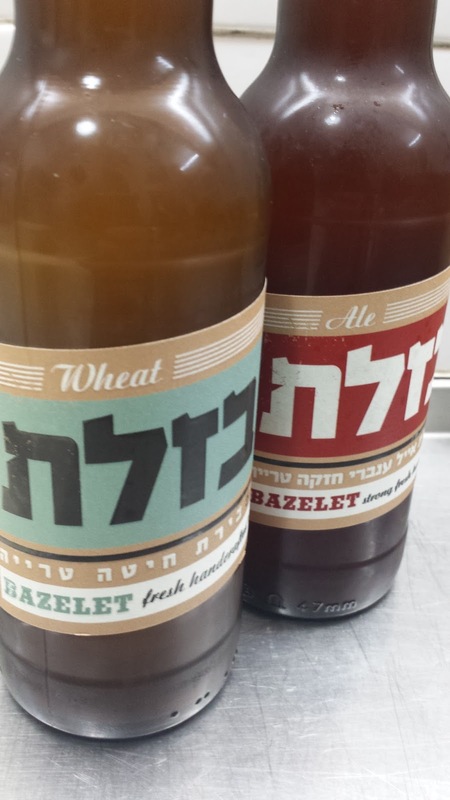 Please note that although the beers are certified kosher, the Bazlet brewhouse restaurant (which is located in the same industrial complex in Katzrin as the Golan Heights Winery) is not certified kosher. As always, please remember to drink responsibly and to never waste good beer unless there is no designated driver. If you've tried this beer or any others which have been reviewed on the kosher beers site, please feel free to post your comments (anonymous comments are acceptable).